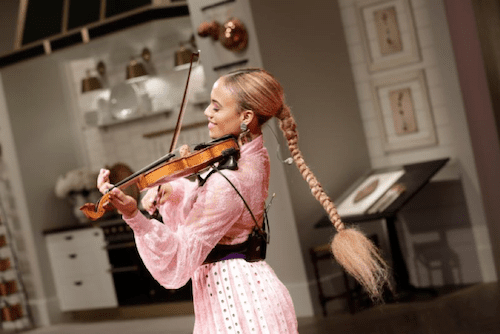 VIOLINIST EZINMA SIGNS TO UNIVERSAL MUSIC CLASSICS IN THE U.S.
30 January 2019 (Toronto, ON) – Classically trained, hip-hop inspired violinist Ezinma (pronounced Ez-ee-ma, aka EZI) has signed to Universal Music Group’s Universal Music Classics, USA. Her inventive covers, which combine hip-hop and classical genres, have gained her a massive following on Instagram, and have led to multiple brand and beauty endorsements. Now, she’s signed to the world’s largest music company. Today, Wednesday January 30, Ezinma makes her national TV appearance debut on the nationally syndicated talk show Pickler & Ben, with her song “Sunflower in D” which combines Post Malone & Swae Lee’s “Sunflower” from the hit movie Spider-Man: Into The Spider-Verse with Pachelbel’s “Canon in D.” Tune into the show at picklerandben.com/watch. Ezinma is set to go into the studio and expected to release new music throughout 2019. Universal Music Classics is the US home for European imprints Decca, Decca Classics, Deutsche Grammophon, ECM, and Mercury KX, as well as the US-based label Decca Gold, which serves as the American home for new classical and crossover artists. The revitalized Decca Gold imprint has forged partnerships with the New York Philharmonic, The Van Cliburn International Piano Competition and Carnegie Hall’s Lullaby Project, as well as new artist signings with Bill Murray, Jan Vogler and Friends, Sarah Brightman, Shulem, Anthony Roth Costanzo, Vocal Point, Il Divo, Nadine Sierra and more. The present roster for all of Universal Music Classics in the US includes Andrea Bocelli, Lang Lang, Max Richter, Renée Fleming, Cecilia Bartoli, Daniil Trifonov, Anna Netrebko, Tori Amos, Ólafur Arnalds, and more.